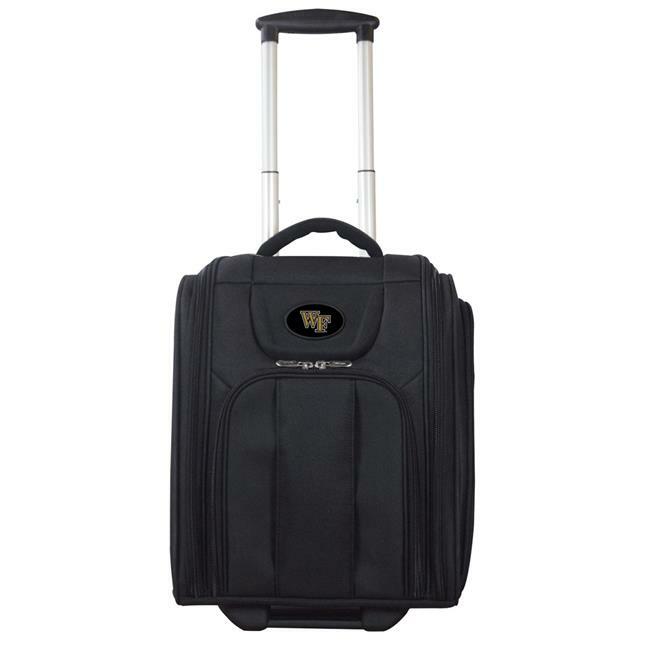 The NCAA Wake Forest Business Tote laptop bag in Black has everything you need for a quick overnight trip. It features a lightweight nylon case with a roomy main compartment for clothing and a separate computer sleeve. There is also a zippered exterior side pocket for electrical and miscellaneous accessories plus a roomy front zippered pocket for pens, pencils and other small business accessories. Also contains a key clasp. Its high end true ball bearing skateboard wheels provide excellent mobility. Has a padded grab handle for easy lifting and a backstrap that enables the overnighter to slide onto the handle of your roller suitcase. The L502 is configured to fit under most airline seats.